The Centennial mosaic by Lindsay Edward, January 2011. 1959 was Queensland’s Centennial Year. To celebrate in a project that was contemporary yet gracious, the Queensland Cabinet voted to develop a new library centre around the nucleus of the then Queensland Public Library. Two important features of the extension were a wall decoration around the sweeping curve between William Street and Queen’s Wharf Road and a sculpture addressing the river. The competition for these was held in 1958. The wall decoration needed to be seen at a long range, yet have close-up interest. 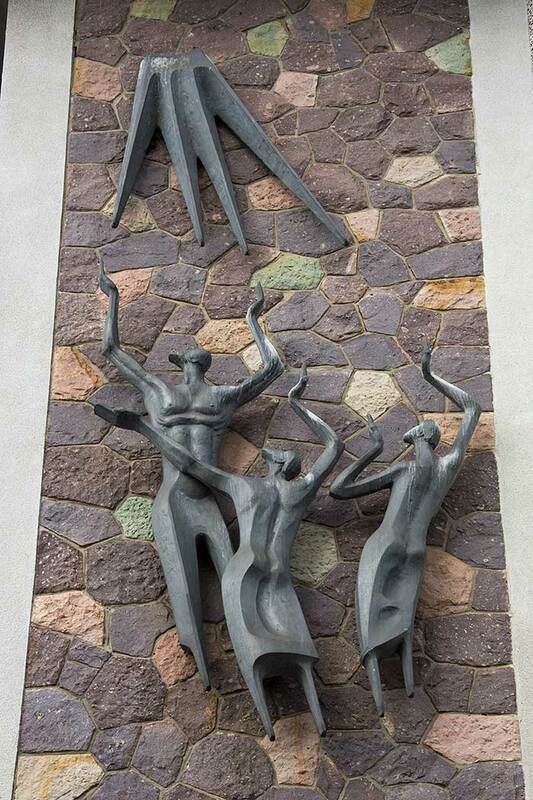 The sculpture had to be incorporated with or applicable to a rubble stone or porphyry wall. Both needed to be appropriate for a public library and to mark the centenary of self-government. An architectural emphasis of the project was the subordination of the new section of the building to the old. The judging panel referred to it as an aesthetic problem involving the unspoiled retention of a building which had graced Brisbane since 1879. The new building, by its very placement, was none-the-less dominant and, it was noted, a humanising enrichment was called for. Victorian artist and educator Lindsay Edward won the £500 prize for the wall decoration. Edward was born in 1919 and had studied at the National Gallery of Victoria. In 1958 he was head of the painting section of the Royal Melbourne Technical College (now RMIT) and had only recently begun experimenting with mosaic. The Centennial mosaic covers a wall 68 feet (20.72 metres) in length and 14 feet (4.26 metres) high. In a Melbourne Age article in July 1958 Edward described the mural as ‘not a literal subject’ rather as ‘a basic formation of organic forms indicating growth and development’. The £200 prize for the sculpture was won by Leonard Shillam for a sculpture cast in aluminium showing three symbolic figures reaching towards the rays of the sun. Called ‘Enlightenment’ it represents the dissemination of enlightenment to mankind. Shillam, a local Brisbane artist, had won a scholarship to study art in London in 1938-39. He returned to Brisbane following the outbreak of the Second World War. In 1942 he married fellow sculptor, Kathleen O’Neill. Until their deaths in 2005 and 2002 respectively, both were keenly involved in the artistic and cultural life of Queensland. In 1968 they founded the Society of Sculptures Queensland. Leonard Shillam was the first instructor in sculpture at the Queensland College of Art in 1975 and both he and Kathleen Shillam received the Order of Australia in 1986 for services to sculpture and education. Both artworks had to be completed by May 1959 to meet deadlines for the Centennial celebrations. 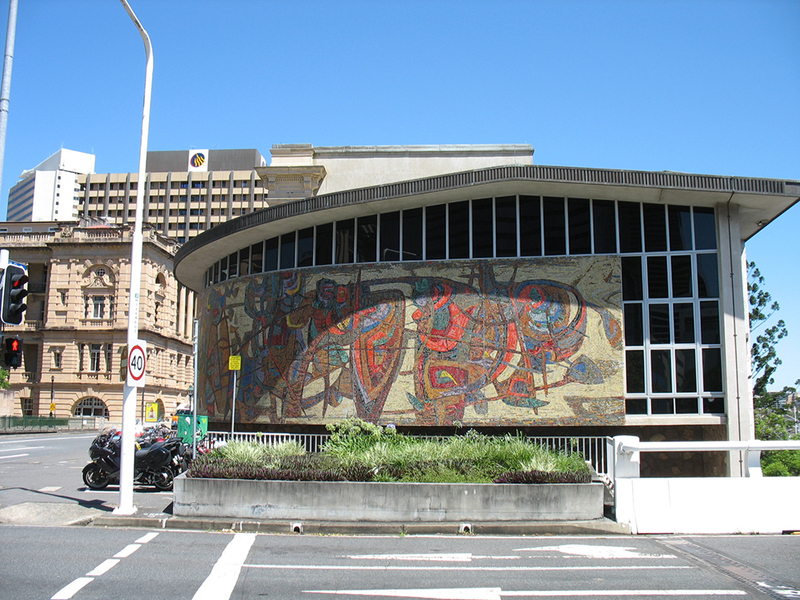 Read the Queensland Heritage Register citation for the State Library (former).